The Honeywell motorised valves we see most commonly in the UK are the Honeywell V4043H zone valve (Honeywell 2 port valve) and the Honeywell V4073A mid-position valve (Honeywell 3 port valve). Both motorised valves use the same Synchron valve motor. ACL Drayton motorised valves are very similar in operation, as are Iflo and British Gas valves which appear to be badged Drayton valves. There’s a section below about the British Gas BGMVSP-2 two port valve. We’ve written a longer, more comprehensive article about Honeywell motorised valves and their faults here. If you click the link it will open in a new tab or new window so you access both articles. This system had 2 Honeywell V4043H two-port motorised zone valves, one controlling the radiator circuit and one controlling the hot water circuit. With the central heating programmer set for hot water on (but not central heating) the boiler would not fire to heat the hot water. If central heating was selected too, and the room thermostat turned up so that the radiators came on, the hot water would heat up. The typical sequence with two-port zone valves works like this: The programmer is set for a hot water demand (hot water on) and sends a signal to the hot water cylinder thermostat. If the cylinder stat is calling for heat it sends the signal on to the zone valve controlling the hot water circuit and this drives the valve open. Most Honeywell V4043H zone valves are also fitted with an auxiliary circuit, two wires, a grey wire in and an orange wire out, connected by an internal switch or end switch. The grey wire is (normally) permanently Live. When the valve is driven fully open by the signal from the programmer, the internal end switch closes, connecting the grey wire to the orange wire which also becomes Live. The orange wire then sends a signal to operate the boiler and pump. The term “closes” when used with switches feels counter-intuitive to many people. We close a switch to make the circuit complete; when we turn on a light switch we are closing the switch. Strange but true! The hot water zone valve on this customer's system was winding most of the way open but not quite far enough to close the end switch, so it could not fire the boiler. With the valve largely open, hot water would heat up if the other Honeywell zone valve (the heating valve) was firing the boiler but not if hot water alone was selected on the programmer or if the room thermostat was up to temperature. Sometimes it is possible to free a sticking valve, at least temporarily, by repeatedly driving the valve open manually using the lever (with the system switched off) or by removing the power head (the actuator) and repeatedly operating the valve manually using a small spanner. But be warned! Early Honeywell motorised valves had actuators (powerheads) which could not be removed without draining down first. If you disconnect these, water will flood out. We believe that the valves with powerheads which can be safely removed are the ones with the "pip" on the top of the silver metal case but we are not certain of this. If we come across a very old valve without the pip (and these are usually 20 or more years old) we never remove the powerhead! If you remove the powerhead and operate the valve mechanism manually using a small spanner, be careful not to turn too far or too hard. The small rectangular brass "tongue" which operates the valve below only turns about 70� for the 2 port valve and only about 45� for the 3 port valves. You must feel for this; it does not turn full circle like some valves! We changed the failing zone valve with a new 22mm Honeywell V4043H zone valve and tested the operation. Everything worked normally with the hot water now operating correctly on its own again. Since the boiler worked OK for hot water we looked at the programmer to check that it was set to call for heating and checked that the room thermostat was set high enough to be calling for heat. The manual lever of the 3 port valve was only slack for about one third of the length of the slot which is the normal position for hot water only. The valve spindle did not feel unusual (tight) when we pushed the lever against the spring and the valve returned normally. Using a multimeter set to 750V AC we checked for 230V between the valve white wire and valve blue wire (in the local junction box) and found 230V present so we suspected the valve motor. After isolating the electrical power we disconnected one lead from the motor within the valve actuator and checked the resistance through the motor across the two motor leads. This figure is normally about 2400 ohms but in this case the leads were open circuit, with a resistance reading millions of ohms, indicating a break in the motor windings. We changed the motor for a new genuine "Synchron" motor (our experience of cheaper, generic motors is that they can fail very quickly) and the system worked fine, with the mid-position valve opening to heating correctly on demand. Original Synchron motor removed from the Honeywell V4073A valve. The Synchron motors fitted to Honeywell motorised valves have blue wires. 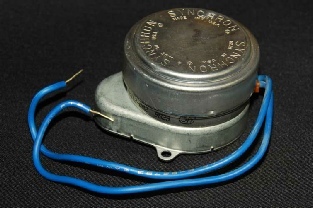 Most Synchron motors have orange wires. The manufacturing date code is written on the side of this motor, 9823, week 23 in 1998. Unwanted hot radiators can be caused by bad pipework design but this system had had no pipework changes and had worked normally before. The Honeywell V4073A motorised valve rests in the hot water only position (the heating port, A, is closed) when the valve is de-energised. However, if hot water was satisfied and heating was the last thing calling, the valve can remain partially energised with the heating port open. We switched off the power and the valve rested in the hot water only position. Typically, in this position, the lever is loose in the slot for about one-third of its travel, with the remaining two-thirds of the travel pushing against a heavy spring. With the boiler running, the pipe from the motorised valve (port A) to the radiators immediately became hot, indicating a fault in the valve. The rubber ball in the Honeywell valves can become dented if left in the hot water only position for a long period. This often happens during the Summer when no heating is called for. The dent prevents the ball from seating correctly for a while, allowing a small amount of let-by into the radiator system but this will often resolve itself after a few days. Honeywell designed the valve so that the ball turns slightly on its spindle each time it sits down. Clever engineering! With this design the ball tends to round itself up and avoid permanent dents. When we buy new Honeywell valves to put on stock we check that they are in the locked open "manual" position for storage. That way the ball doesn't sit down and doesn't dent. This ball was either permanently damaged or the seating was damaged or contaminated so we changed the complete valve, both the power head (actuator) and the body and the problem resolved, hot water cylinder warming up normally with no unwanted hot radiators. Hi, wondering if you could help? Recently called out to a 'S' plan heating system incorporating a Honeywell ST999 programmer and 2 V4043H motorised valves. The problem the customer has is that boiler will not turn off. The boiler has never had to be reset so therefore has never overheated. The thermostat is also working O.K. If both sliding switches on the programmer are set to "off" the boiler stills fires. The only way to switch off the boiler is by isolating the programmer via the fused spur or by turning the thermostat on the boiler right down/off. The other/same(?) problem is that one of the motorised valves is permanently open (the one for central heating) I've removed the cover and tried moving the valve manually but it is solid. Obviously the first step to be taken is to change the faulty valve. The first question being if the 2 port is stuck permanently open will this create a permanent demand for heat (regardless what the programmer is set on) or would it be fair to assume that the programmer is also broke? Cheers for your help, D.S. Honeywell 2-port valves have an end switch in the actuator (also called the power head) which closes (makes contact) when the valve is fully open. The valve typically has 5 wires: green/yellow = Earth; blue = Neutral; brown = Switched Live from room stat or from cylinder stat; grey = Permanent Live; orange = Switched Live feed to boiler (and pump). The grey and orange wires are part of what's called an auxiliary circuit. With some Honeywell 28mm two port valves there may also be white wire which was used with some wiring configurations where the hot water side was gravity only and not pumped; generally this white wire is not required and should be made safe electrically (taped off) and ignored. The same thing can occasionally happen if the end switch arcs, welding the contacts together. In that case the valve closes but the demand to the boiler remains. One point to note, the auxiliary circuit (grey and orange wires) may be wired either way round. Typically the grey is Permanent Live and the orange is Switched Live feed to the boiler and pump but you will occasionally find that the grey and orange have been reversed with the orange as the permanent Live and the grey as the switched live feed to the boiler and pump. It makes no difference. In the case in this email the valve spindle has probably seized (water gets past the O rings and causes corrosion). The valve needs to be changed and it should sort the problem out. There's no reason to suspect the programmer. It may be possible to temporarily sort it out by freeing the spindle but it won't last indefinitely before it seizes up again. Unless the valve is very old (more than 20 years), the actuator (power head) should be able to be safely removed from the valve. If the actuator cover does not have a raised pip on the top (a reversed dimple), do not remove the actuator or you'll get a flood. If you are able to safely remove the actuator, use a spanner to move the spindle repeatedly and it will usually become free. Remember, it only ever moves through about 70� for 2 port Honeywell valves and only about 45� for 3 port Honeywell valves so don't force it! In the UK most domestic Honeywell zone valves are either 22mm compression (V4043H1056) or 28mm compression (V4043H1106) though they are also available as �" BSP Female (V4043H1007) and 1" BSP Female (V4043H1080). All four of these valves have an auxiliary switch. 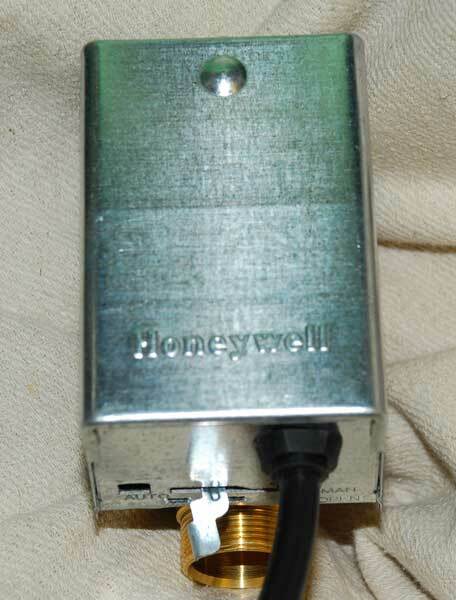 The Honeywell �" BSP Female zone valve (V4043C1156) does not have an auxiliary switch. Most Honeywell zone valves are closed in the de-energised state (all of the valves above) but Honeywell also make a 22mm compression zone valve which is open in the de-energised state (V4043B1257) and a 28mm compression zone valve which is open in the de-energised state (V4043B1265). Both these valves are much rarer but it's important to replace with the correct valve. Radiators and hot water both worked normally in this house except that the customers could hear the circulating pump running occasionally in the night and the boiler would sometimes fire up, even though there was no demand from the programmer. This fault is most commonly caused by a motorised valve. Most two-port motorised valves carry an auxiliary switch which is used to send power to the boiler and pump when the valve is open. 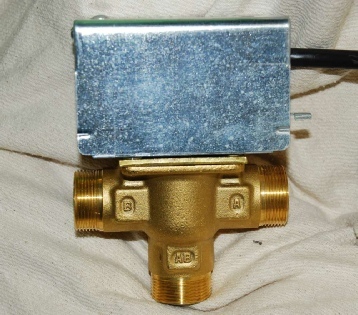 If the valve is stuck fully open this auxiliary switch will be permanently closed (permanently connected) and the boiler and pump will continuously receive a signal to make them run. Even if the valve is not stuck open the switch contacts can occasionally be found to have welded together (caused by the spark arcing across the switch contacts). If the contacts are welded together, the auxiliary switch will permanently send a signal to the boiler and pump causing them to run, even when the motorised valve is closed. If both heating and hot water valves are closed when this happens, the heated water from the boiler will pass through a bypass, if one is fitted, before going back to the boiler. If no bypass is fitted the boiler may kettle violently, with loud bumping and banging noises as the heat can’t be dissipated, and it may to go overheat lockout. There were two motorised valves fitted to the system we were looking at, a Tower VAL222MV two-port valve controlling the radiator circuit and a blue British Gas BGMVSP-2 two-port valve controlling the hot water circuit. Both valves had auxiliary circuits and one of these was causing the boiler to run but we had to decide which. Neither valve remained in the permanently open position when the demand was switched off so the problem was most likely caused by an auxiliary switch welded in the connected (closed) position. We isolated the electrical power from the central heating wiring controls and disconnected the auxiliary circuit of the Tower valve. The problem remained, suggesting it was caused by the British Gas valve. We reconnected the wiring of the Tower valve and disconnected the auxiliary circuit of the British Gas valve. This got rid of the immediate problem showing that this valve was causing the problem. With the auxiliary circuit disconnected, the valve would still open on a demand from the programmer and cylinder thermostat but would not fire the boiler. Left like this, the hot water would only be heated when a radiator demand was causing the boiler to fire and the pump to run. We replaced the failed British Gas BGMVSP-2 two-port valve with a Honeywell V4043H 1056 motorised valve and the problem was resolved. Most Honeywell zone valves are closed in the de-energised state. They are fitted with a manual lever, running in a slot on one end of the valve. When the valve is closed, this lever is "loose" for about one third of the travel of the slot with the rest of the travel pushing against a heavy spring. When the valve is powered open the lever is loose for the entire travel of the slot. With hot water selected on the programmer, and the cylinder thermostat calling for heat, we checked the lever and it was loose across the whole travel of the slot but the boiler didn't fire. Operating the manual lever, the valve felt normal. Sometimes you can clearly feel that the valve is stiff, indicating that the valve spindle may be seizing up. Repeatedly operating the manual lever for the full length of the slot may temporarily resolve this. With the power back on and hot water only selected, the valve rested in the correct position. If it had opened the heating port (and the lever become loose for all, or nearly all, of the travel in the slot) we would have been looking for a fault elsewhere, either a fault with the central heating programmer or the room thermostat or with the wiring. The brown wire drives the heating valve open when there is a demand from the programmer and room stat (or cylinder stat with the hot water valve). 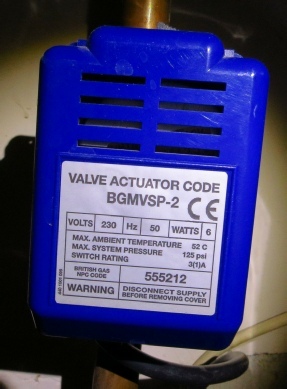 When the valve is driven fully open, the end switch inside the actuator closes (connects), completing the circuit between the grey and orange wires. Since the grey is permanently live, the orange becomes live and power goes to the boiler (and pump). If the valve spindle seizes up with the valve open, the switch remains permanently closed. The grey and orange wires remain permanently connected and there is a permanent demand sent to the boiler (and pump). For information, the Tower VAL222MV valve appears to be a clone of the equivalent Honeywell valve (or maybe the same valve badged as a Tower valve. Other similar valves are the Siemens CZV222 two-port, 5 wire valve and the Flomasta 27900SX two-port valve.